Friday might be my favorite day of the week on this blog. 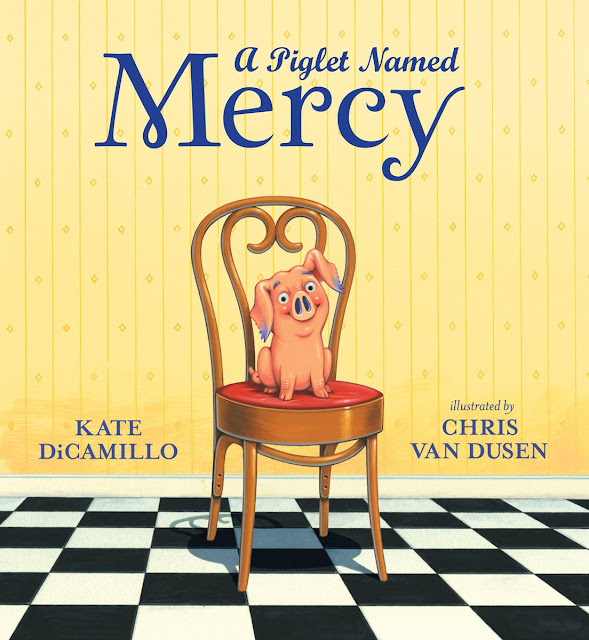 I can always depend on amazing authors, illustrators, teachers, and librarians to finish my sentences. A huge THANK YOU to everyone who has participated over the past two years. This week's special guest is Aaron Starmer. He dropped by to chat with me about The Riverman, storytelling, reading, school libraries, and my beach house. I wrote the words in red, and he wrote the words in black. Many thanks, Aaron! Fiona Loomis is "unknowable in the way that all girls are unknowable, but also in her own way." That's a line from the book and it sums up the hero Alistair's view of Fiona in the beginning. She's a mystery. But there's a problem with viewing people as mysteries. You tend to want to figure them out, rather than get to know them. And that's the wrong way to form a relationship, as I think Alistair discovers. Fiona is knowable. Like anyone, it takes time and effort to get to know her. 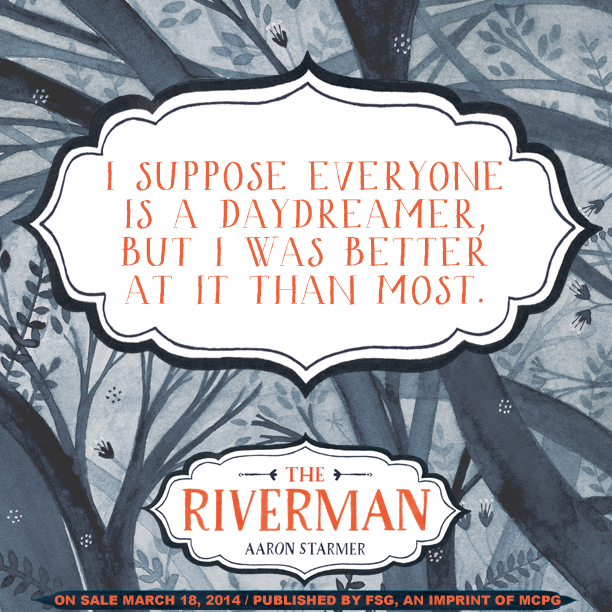 I hope The Riverman surprises readers. I know a lot of people will be a bit befuddled when they finish it, but I urge them to look at it with fresh eyes. They don't have reread the thing, just ask themselves why the story was presented in the way it was. They might begin to connect more dots than they realize. The Indubitable Dweeb is the name of my blog. I don't update it nearly as much as I should. There's some fun stuff buried in the archives from 2010 and 2011, but I've been too busy to keep at it. And the readership consists of about three people, so no one's really clamoring for more. The name comes from my first book (DWEEB) and from the fact that I am undoubtedly a dweeb. Indubitable is an underused word, in my opinion. As a child I was a storyteller. It's always been an integral part of my life and I think people sometimes undervalue storytelling in their lives. That's not to say that everyone needs to be rabid readers of novels, but I think that the ability to enjoy and to tell a story is an essential one. It's more than recreation. It's how we understand other people. It's one of the ways we form empathy. Whenever I visit a school I tell a story. It's been 25 years since I was in middle school, but certain situations are universal so I like to air my adolescent laundry. Detail my embarrassments. My triumphs. The mundane situations. Middle school is a glorious and hideous time and everything in between. The message for kids shouldn't always be "It gets better" or "Enjoy it while you can." They are in the middle of something significant. They should be in it, survive it, laugh at it. I am who I am because of those stories. Reading is boring sometimes. It's a chore sometimes. But (and this is a rather large but) when you find a single book that grabs you, trust me there are countless other books that will grab you as well. 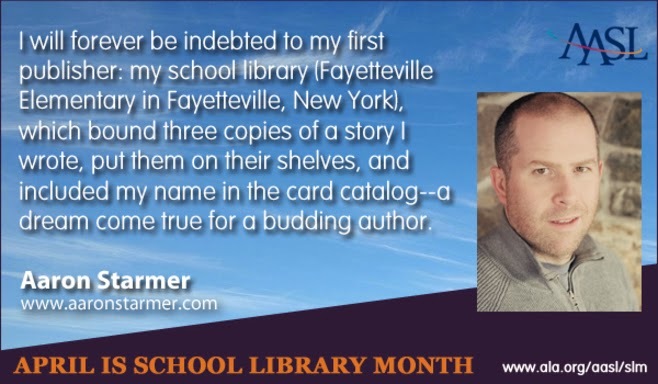 School libraries are there to help you find that next book that will grab you. That's the job of librarians. To make sure you don't waste your time. If you've ever visited a new city, you know it helps to be guided by someone who lives there. Librarians live in the library (really they have murphy beds that fold down from the self-help section). Mr. Schu, you should have asked me to dog-sit at your beach house for a month or two. I assume you have a beach house, and a dog, and the desire to give me a vacation, because I could use one. If I'm wrong, then you should have asked me if I'm grateful for the opportunity to share The Riverman with readers of your site. And the answer would be an indubitable YES. I am giving away one copy of The Riverman. 1. It will run from 4/11 to 11:59 p.m. on 4/13. 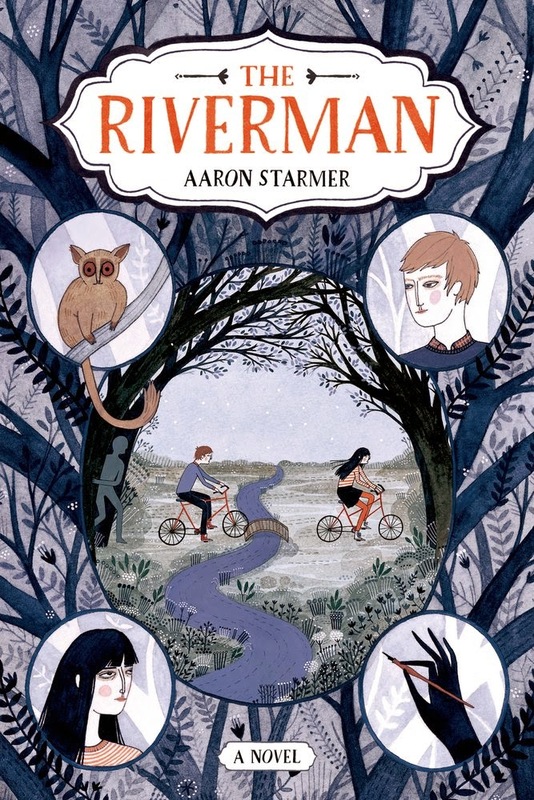 Borrow The Riverman from your school or public library. Whenever possible, please support independent bookshops. This look like something my daughter and I will love! Looking forward to it.